Note: this is part two of a five part series of articles - subscribe to our newsletter, follow us on Facebook, Twitter, and Google+, or contact us to receive instant notice on future articles or learn more. 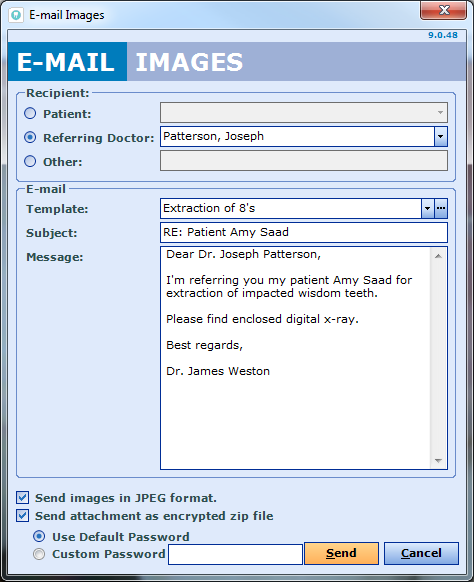 Going Paperless is the single most effective change a dental practice can make. However, it is important to know that there is no standard cookie cutter path. Every practice is unique, and the plan you create is always as unique as your practice. More importantly, your plan of going paperless has to take into consideration of the ongoing risk management and the expected gain in profitability. In other words, your software system must account for growth and scalability while remaining secure and compliant. ClearDent is a leader in the paperless dental practice management field, with years of experience helping thousands of professionals realize their aspirations and potential by switching to paperless. We'd like to share our guiding principles, in a five part series. In dentistry, there are actually three different guidelines and regulations that need to be observed and practiced to ensure both the well-being of patients, and the lowering risk of legal woes. In our view, we believe it's a shared responsibility between the dentists and the software vendors of their choice. Dentists need to review the following guidelines and regulations, and the software vendors need to make sure their products meet them. Otherwise, the product is no longer a viable choice regardless of what interpretation a dentist may have on the guidelines and regulations. First and foremost, a dental software is considered a medical device, and it either is classified as a Class I or a Class II device depending on the functionalities in the system. This requirement is also cited by the Royal College of Dental Surgeons of Ontario in their Electronic Data Management Guideline. In a nutshell, a medical device license requires an ISO certification. The certification confirms that the software vendor has a quality management system in place and there is a reasonable evidence suggesting that the product is of high quality. In other words, it means if the software is showing an electronic chart and a digital x-ray on the screen, you can be confident that the data presented for the diagnosis is accurate. For details on how the medical device license and ISO certification impacts dental software and dental practices, please see this article on our blog published on August 31, 2012. During our past years of experience working with dental professionals, we found everyone to be quite on top of the requirement of the recordkeeping guideline by the provincial colleges (it varies slightly from province to province). This is very impressive and is a definitive statement on the positive discipline of the dental profession in general. However, what we also found is that most dental professionals using different software systems often found the clinical data they were asked to keep had no place, until they start using ClearDent. At ClearDent, we contact each provincial colleges on a regular basis to be abreast of changes. That's why we have database fields for updated prescription rules in Ontario, sterilization and patient medical history rules in Alberta, etc. - effectively immediately upon the date of the new guideline establishment. Our Electronic Charting and Document Management modules are designed specifically for the best practices of recordkeeping, and are frequently updated to bring the right balance between college requirements and ease of use. We not only ensure it will be an easy transition, but in fact, we frequently make it easier to record the necessary and required information on computer than on paper. ClearDent supports customizable displays for every screen that potentially can be seen by patients, be it Scheduler, Digital Imaging, Patient Notes, and so forth. 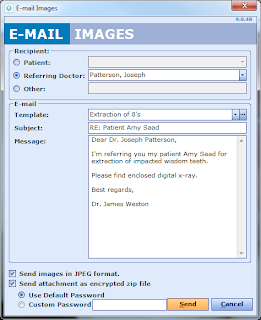 Most importantly, we encrypt any electronic communication to a 3rd party that may contain private patient information, such as an email referring a patient to a specialist, which may contain digital x-rays, treatment history, and other clinical data using AES-256 encryption standard. The AES-256 is the strongest encryption possible and the only known encryption that's currently still considered unbreakable by any organization that don't have access to your password or certificate, including governments. In fact, to practice what we preach, you may also have noticed that ClearDent's main website is running on HTTPS (hyper text transfer protocol secure) instead of the regular HTTP (hyper text transfer protocol) used on most websites. We use HTTPS because it is the same protocol used by banks and many large organizations that takes privacy seriously. As our main website is where our customers communicates with us, we want to make sure it's also secured and their privacy is protected to the maximum possibility.